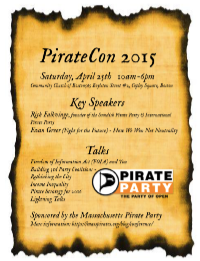 PirateCon 2015 was Saturday, April 25th. It started at 10am and ended at 6pm. After the conference, a group of us went out for dinner. We held elections for the Pirate Council. Evan Greer, Campaign Manager for Fight for the Future, gave the keynote speech at 10am on How we won Net Neutrality. Rick Falkvinge, founder of the Swedish Pirate party and indeed all Pirate Parties, gave our final talk on Pirate Strategy. You can find pictures of the conference here and here. We’ve posted raw video on MEGA. Please contact info@masspirates.org if you can help with editing. We’re posting talk slides as they become available. Rick Falkvinge is the founder of the first Pirate Party and a campaigner for next-generation civil liberties. In particular, he stresses how the copyright industry works with security hawks to erode the parts of Internet that guarantee civil liberties. On this platform, one of privacy and digital rights, his party became the largest in the below-30 demographic in the 2009 European Elections, and his nascent party has now spread to 70 countries. He has been named a Top Global Thinker by Foreign Policy magazine and shortlisted as one of the world’s most influential people by TIME Magazine. He can be found at falkvinge.net. Evan Greer is campaigns manager for Fight for the Future and a radical genderqueer singer/songwriter, parent, and community organizer based in Boston. (S)he writes and performs high-energy acoustic songs that inspire hope, build community, and incite resistance! At 25 years old, Evan tours internationally as a musician and facilitates interactive workshops to support movements for justice and liberation. Wielding an arsenal of fiercely radical songs that vary in style from pop-punk poetry to foot-stompin’ bluegrass singalongs, Evan has been honored to collaborate, tour, and share stages with artists as musically diverse as Pete Seeger, Immortal Technique, Billy Bragg, Tom Morello of Rage Against the Machine, Pamela Means, Against Me!, The Coup, Anne Feeney, Oi Polloi, State Radio, Leftover Crack, Emma’s Revolution, The Mammals, Defiance Ohio, Holly Near, Chumbawamba, and Vicci Martinez (featured on NBC’s “The Voice”.) (S)he can be found at www.evangreer.org. Seth Zeren works in real estate development for a small local firm where his main projects are a downtown infill project in Salem, and a mixed-use, mill reuse project in North Andover. 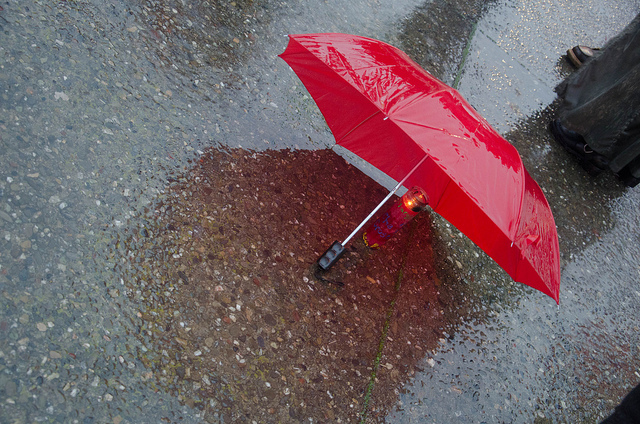 He teaches urban planning and sustainable design at Boston Architectural College. He is increasingly involved in Tactical Urbanism as a strategy for breaking the anti-change log jam through low cost experimentation, and as a way of broadening political participation in the creation of our urban habitat. He is also on the Board of the local Congress for the New Urbanism chapter based here in Boston and has been active with Livable Streets here in Boston and also with Strong Towns nationally. Tim Devin’s projects focus on community, communication, and social change. His work has been included in art and urbanist shows across the US, Canada, and Europe, and has been featured in such news sources as NPR, CBC and, closer to his house, the Boston Globe. He can be found at www.timdevin.com. Evan Falchuk founded the Massachusetts United Independent Party and was its 2014 nominee for Massachusetts Governor. His campaign surpassed the three percent threshold required by state law for the United Independent Party to earn official party status in the Commonwealth of Massachusetts. 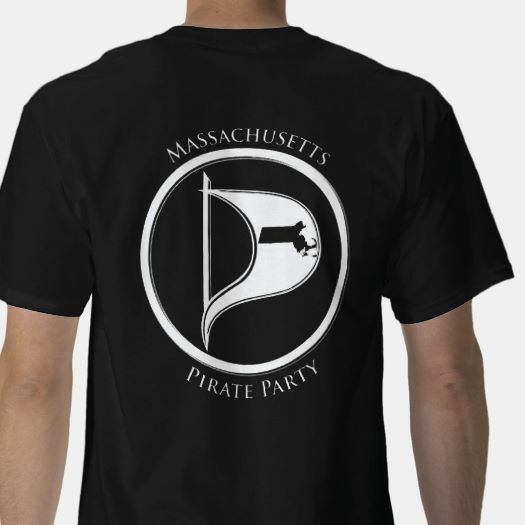 Noelani Kamelamela is First Officer of the Massachusetts Pirate Party and was its candidate for the 34th Middlesex State Representative district winning 12% of the vote in 2014. Frank Jackson is Co-Chair of the Massachusetts Green-Rainbow Party. Alwin Hopfmann is Membership Renewals officer for the Massachusetts Libertarian Party and a long-time Libertarian Party activist. Muckrock developer Allan Lasser likes computers, government, and other complex man-made systems. He likes these things because they are unfinished and imperfect, yet foundational to daily life. He graduated from Boston University in 2014 with degrees in Computer Science and American Studies. Send messages to allan@muckrock.com, tweets to @allanlasser, and encrypt secret notes with his PGP Key. 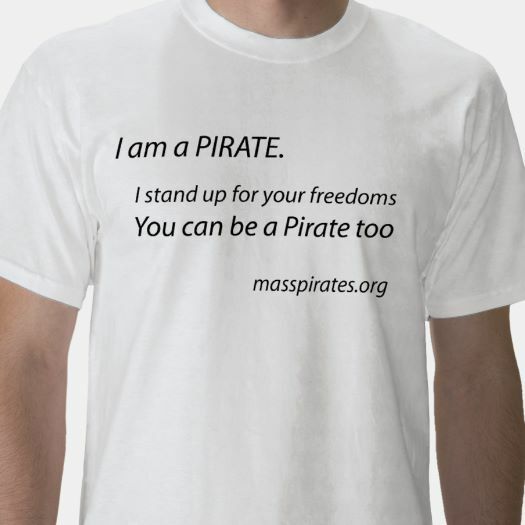 James O’Keefe was one of the three founders of the Massachusetts Pirate Party and is its current Captain. In a past life he was the Green-Rainbow Party’s nominee for Massachusetts Treasurer in 2002 and 2006 winning 160,000 (8%) and 320,000 (16%) votes respectively. Registration was $10. Youth under 18 were free. It was held at the Community Church of Boston at 565 Boylston Street #2, Boston, MA 02116. We provided free wifi at the conference. We offered child care for preschool aged or older children. 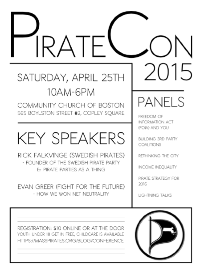 Besides telling your friends about the conference (there was a Facebook event), we provided PirateCon 2015 posters supporter could print out and put up in your city, town or campus. Both are PDFs. Thanks to Kate & Kendra for putting them together. SO GLAD TO MEET JAMES O KEEFE yesterday. I am just too busy to fit this in but would love a link to watch later. I would love to come to after meeting if ok.